I don’t bring you a review. I had a book in mind but to do a View from Page Thirty from, but another crisis has been brought to my attention: Barbie. “Barbie? What does a child’s toy have to do with book site?” Well Barbie, in its ever growing empire, has spread to books. I am sure that there were Barbie books when I was a kid, but I never remember them being as bad as this. I still really like this doll. Fun fact! The internet has been a flutter today and yesterday about I Can Be a Computer Engineer by Susan Marenco where Barbie is supposed to go through a fun story about Computer Engineering. In summary, Barbie is designing a game but doesn’t actually code it instead offloading that to the boys to do. She also breaks her and her sisters computer by infecting them with a virus that wipes design and Skipper's homework and music library. The boys fix that, too. Then in the end, in probably the cherry on top of this frosted cake wreck is Barbie taking all the credit in the end for fixing her sisters computer and for the coded game. The Amazon reviews are worth reading for this one. It’s just so frustrating. So frustrating. I graduated college with a computer science degree. Do you know how many women were in my program and the computer engineering program put together? On average, three to five. At any point it was usually around three. This was in a computer department of about 100 I'd say. This is a new phenomenon. Computing was women’swork in the 1950s. The first computer language was written by a woman, Ada Lovelace. But something happen in the mid-eighties that just killed women going into computing. 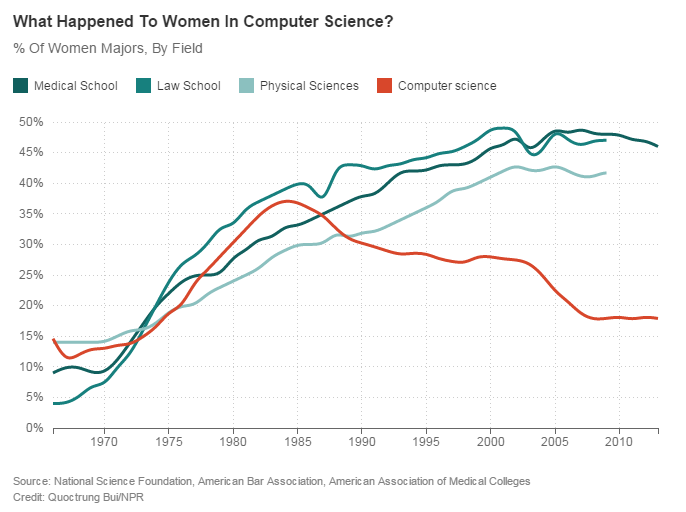 The NPR piece where this graphic comes from, When Women Stopped Coding, is a great listen on that phenomena, but in general it’s because of schlock like this book getting into the hands of little girls. Steven and Brian are nice guys, I’m sure. But Steven and Brian are also everything frustrating about the tech industry. Steven and Brian represent the tech industry assumption that only men make meaningful contributions. Men fix this, men drive this and men take control to finish this. Steven and Brian don’t value design as much as code. Steven and Brian represent every time I was talked over and interrupted — every time I didn’t post a code solution in a forum because I didn’t want to spend the next 72 years defending it. Steven and Brian make more money than I do for doing the same thing. And at the same time, Steven and Brian are nice guys. The issue is not on a micro level, it’s on a macro level. It’s the fact that Barbie can’t just be a software developer, she designs but doesn’t code. It’s the fact that after six years of marvel movies, we have yet to have a female lead. It’s the fact that LEGO released its special “girl colored” line with “girl approved” activities. It’s the male dominated society. I am sure it is better in some aspects than it was in previous generations, but when it comes to women persuing careers and passions in technology, we are going backwards. I want to conclude with a plea. If a little girl is interested in technology, foster it. Get her some Goldieblox to help with engineering skills. Check out books that feature women doing things for themselves. A great resource for this for books and other media is A Mighty Girl. Lists and lists of female empowerment focused lit and other products! I stumbled into computer science because I enjoyed creating and maintaining a Geocities webpage when I was younger. I didn't know it was something that not many girls did until I got to my first programming class. I am not a coder today but still work in technology, and it is an uphill battle sometimes. So I guess I’ll end this with a cool resource that I know of that we used for our GEMS (Girls in Engineering Math and Science) summer camp for beginning programming. It’s a language called Alice and it’s free. It teaches basic programming skills while using cool graphics and not just boring code. You actually get to see the code in action. Make your own corrections to this book with this awesome website! Hi Julia, thanks for writing this post. I am a female computer programmer and it took years before I was taken seriously in meetings. Customers would often be very surprised when I was introduced to them and still wouldn't listen to me when I tried to advise them. The world is changing, but very slowly. When I started in this field 13 years ago, I was the only girl in the department, now I manage team of 6 and half of us are girls. Young girls need to know that they can do anything, drive a truck or be a brain surgeon, they shouldn't be herded towards or away from any job based on their gender. I know what you mean about being taken seriously. I remember moreso that happening in certain college classes than at my job though, luckily. That may be more because I am not doing coding anymore but more consulting and configuring. I had issues with being young and having customers second guess my knowledge though. I love that last line! I agree with it completely. If you are a little girl and want to be a singer or a teacher, go for it. But if you want to be a mechanic or a coder that's fine too. Thanks for the comment! I really relate to this! My degree is in Computer Science and I was basically "the girl" in my major classes. I did feel like I had to work twice as hard to be taken seriously but that did feel more like the fact I look young than my gender. This whole attitude of "things are too hard for me to do" drives me crazy. I hadn't seen this but now I MUST go look at the reviews on Amazon! Thanks for sharing! I felt like it was so easy to pick me out from the crowd, I always had to be at 115%. But I guess it worked out though. I really love my job now and am taken seriously as a professional in technology regardless of my age or gender. UGh I have seen many women at DH work that are working in computers. UGh I am so frustrated by this :( As mom to girls I think that this sends a awful message about girls being smart. I think if you look at specific examples you would on the surface see lots of women. I dont know what isn't drawing them into the field in larger numbers though considering how much technology plays into our every day lives. My company has quite a few female developers, too, and I personally have not experienced any resistence in that workplace due to my gender. I dont doubt it happens though. This book however was an awful message. Not so much because all Barbie is doing is design (which fine. maybe she doesnt want to code? ), but the message of "Help me! And then let me take all the credit" just comes off as so manipulative. Urg. I need to go back to reading the ones that people are correcting. And this is why my daughter won't be getting this book. I will say that she did want the girls legos, but not because they were girl things. But because they are pink and purple. She mixes them up with legos that her brother has. I really dislike the message this sends. I'm not in a technology field, but I can understand the struggle. This just rubs me the wrong way. Grr...that makes me so grumpy. My daughter is only one, so we haven't had to deal with Barbie yet. But if they are going to produce drivel like that, it will make our decision very easy. Oh my. I didn't realize this book was a thing, but I will make sure we never carry this at the store I work at. That's an awful message to send to girls. So, go you for making this post! I have so many friends who were designers and coders but it never really occurred to me how that industry is still such a male dominated one. It shouldn't surprise me, but it did. That's such a cool resource. Thank you for sharing! Sorry, rambling more than I meant to, but just wondered how locating specific this tendency might be? Rant away. This is just sad. Glad you pointed out the issues. I grew up in a time when Barbie didn't really have a career (she just had pretty dresses) and LEGO came in primary colours intended for use by both boys and girls. I had Barbies as well as a bucket of LEGO bricks. I also had a toy called Robotix, which was kind of like LEGO, but had some motors so you could build robots that actually walked around (sort of... the two motors I had moved at different speeds, which led to some pretty drunk-looking robots). I'm pretty sure you can't buy the sets anymore, though (unless you find some on eBay... although they're liable to have lots of broken parts; they weren't as sturdy as LEGO bricks). I love the hashtag - and the rewriting of the book. It's a nutso world! I have a PhD and whereas my counterparts always get referred to as Dr. so and so - I'm almost always referred to Mrs. - which I correct at least 5x before the person sticks with the correct title. I don't care so much, but I find it slightly amusing, and I'm sticking to the principle of the thing. My daughter got Goldieblox for her birthday and it's awesome. She'll be getting Roominate for Christmas, designed by a couple of female engineers to encourage girls in science and technology. Woot, computer science girl high five :D. I don't know of many other book bloggers that are programmers, so this makes me happy *hugs* But yes, ugh, so much frustration with this situation. I'm glad that Good Morning America is providing a platform to discuss this issue though! I'm on the other spectrum of computers: hardware. But I've done coding and I'm the media manager/IT for my office. When having to work with the internet/cable/sound/video people on projects they always act a bit weirded out. One older guy had the guts to ask to speak with a MAN instead of me. Thanks for your perspective. I wholeheartedly agree. I signed up for one computer programming class because I really wanted to learn. I enjoyed HTML coding and thought learning other codes would be fun. I gave up after the first day. The room was packed with males, and maybe only 10 of us out of 175 were female. I felt really uncomfortable, especially since I wore a skirt, and unfortunately, I had to sit all the way in the back of the classroom since I was one of the last people to get there. Long story short, I gave up on coding because the male dominance made me uncomfortable, and it felt like I had no personal engagement with the subject. I think technology could attract more women if there were smaller classes of 30 people instead of 200. Fewer people would make the class seem less daunting. I am sorry that was your experience. I feel like that could have easily been mine if I went to a different school. I had the same thought about the HTML and logical next step. I was comfortable enough the first few weeks (even though I felt behind) because the class size was about 35 and there were four other girls in my class (that I sat next to). I think it would have been different if I was in the later class where I dont think there were any girls. I think if my class size were bigger I would have been afraid of asking questions when I was lost or seeking out office hours. I actually got really close with my programming professors in the end. Your point is excellent :) Hopefully you can retry coding one day on your own terms. I know there are a few online resources. Maybe something for web extensions. Thanks for the comment! It is so nice to read it. Love to learn more interesting things from you. Do you write in books? Jamie Talks About Holiday Reads!